Gym Dividers are a great way to extend the functionality and utility of large gymnasiums. 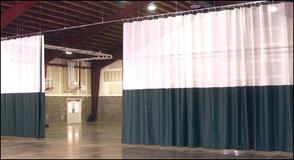 Divider curtains make it easy to partition gymn space to accomodate multiple functions simultaneously. Bleacher America can design your divider curtains with school colors, logos and other unique identity elements. Contact a Bleacher America representative early in your planning stages. We provide free consultation and assistance with partition configurations, accessories, design ideas and budgets.